The Deepwater Horizon blowout unleashed an oil-spill disaster on a scale the world had not seen before. Almost four years later, scientists are still grappling with its environmental effects. In the immediate aftermath, those effects took on the grim, striking forms of oiled birds and marine mammals. Years down the line, the damage is still playing out, but more insidiously and often on a microscopic scale. In one recent study of the spill’s lingering impacts, scientists set out to examine its mark on the tiny hearts of fish embryos. Tragically, the Deepwater disaster struck just as many fish species in the northern Gulf of Mexico, including the critically endangered bluefin tuna, were preparing to spawn. As a result, countless extremely fragile fish embryos were released into waters contaminated by more than four million barrels of crude oil. Oozing from the ruptured well, the oil rose upwards, spreading and mixing with the warmer surface waters – which is precisely where the buoyant fish eggs tend to float. What does that kind of contamination do to a tiny fish-in-the-making? The new study, led by a team of scientists from the National Oceanic and Atmospheric Administration (NOAA), attempted to answer that question. It turns out the toxic oil was like a shot to the heart. The developing hearts of fish embryos are particularly sensitive to the effects of oil contamination, and the study's researchers observed a range of cardiac abnormalities. Exposure to oil harmed hearts by slowing the heartbeat or causing an uncoordinated rhythm, which can ultimately lead to heart failure. Of course, monitoring the hearts of embryos floating in the open ocean would have been impossible. Collecting samples to study from the wild was also not an option – the fragile embryos would never survive the ordeal of being netted and transported. Instead, the team turned to some of the few labs in the world that have succeeded in spawning tunas and other open-ocean species in captivity. There, researchers exposed the embryos of three fish species – the amberjack and yellowfin and bluefin tuna – to samples of oil collected during the Deepwater Horizon cleanup efforts, effectively recreating the sort of conditions that would have existed at the time of the accident. The result? Embryos exposed to the highest concentrations of oil developed severe deformities and died of heart failure soon after hatching. But even specimens exposed to fairly low concentrations (below those seen in many water samples collected during the Deepwater Horizon spill) suffered heart harm that would have cut their adult lives short: when their hearts are affected, predatory fish like tunas can't meet the aerobic demands of their fast-swimming lifestyles. 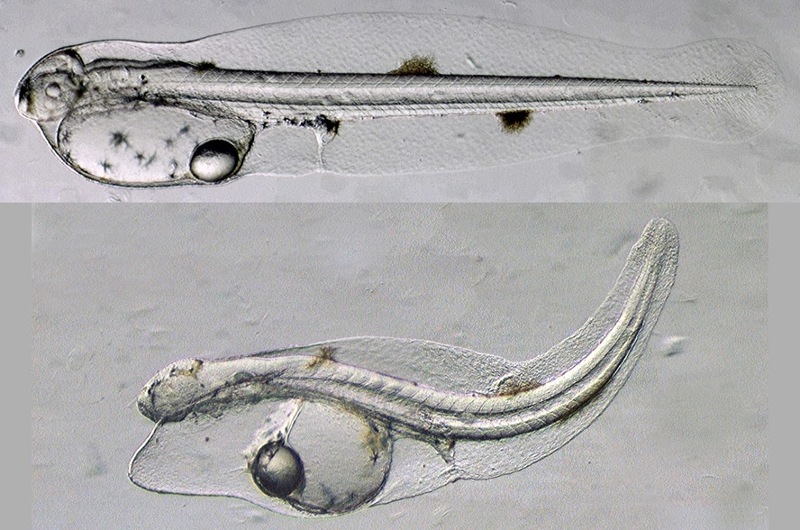 A normal yellowfin tuna larva not long after hatching (top) and a larva exposed to Deepwater Horizon crude oil during embryonic development (bottom). The oil-exposed larva shows abnormalities that include fluid accumulation from heart failure and poor growth of fins and eyes. Image: John Incardona, NOAA. While crude oil contains a complex mixture of chemicals that are potentially toxic to wildlife, the main heart-damaging culprits are called polycyclic aromatic hydrocarbons (PAHs) – and their harmful effects on fish hearts have been linked to other oil disasters, too. "The tunas and the amberjack exposed to Deepwater Horizon crude oil were impacted in much the same way that herring were deformed by the Alaska North Slope crude oil spilled in Prince William Sound during the Exxon Valdez accident,” says Incardona. Because PAHs can persist in marine environments, their overall toll on fish populations can be difficult to measure, but their adverse effects are likely to be felt for years after an oil disaster like Deepwater takes place. Environmental groups have welcomed these latest findings as yet more proof of the long-term harmful effects oil spills have on marine habitats. "Rather than rushing to let BP and its competitors go back to drilling into our oceans, the Obama administration should be devising a smarter energy strategy, charting a course to break our oil addiction by building a clean energy driven future," said ocean conservation organisation Oceana in a press release.